Example of the ice concentration product (%) over the Great Lakes as generated by the GOES-R sea and lake ice concentration algorithm using MODIS Aqua data on February 24, 2008. 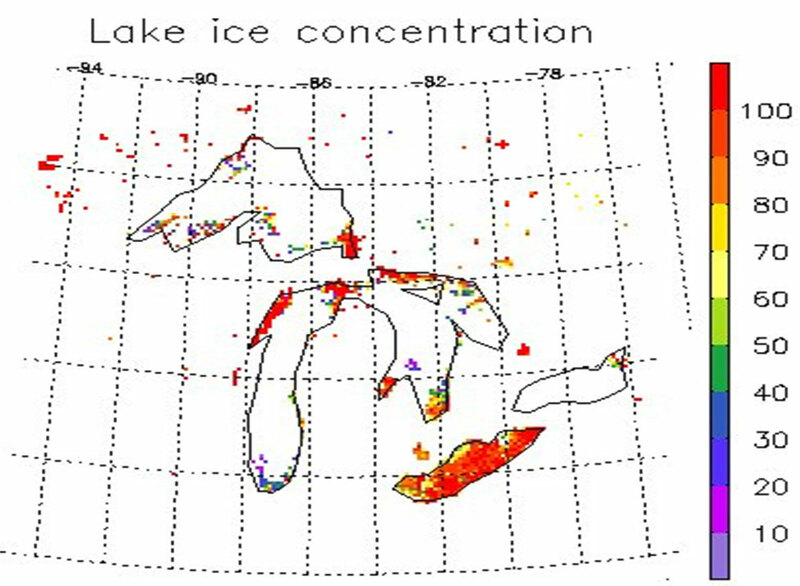 The ice cover and concentration algorithm is responsible for the determination of all ABI pixels covered with ice, and estimation of ice concentration under clear conditions. Ice cover identifies if an ABI pixel is covered by ice and ice concentration reports the ratio of water surface covered by ice as a fraction (in tenths) of the area being considered. Total concentration includes all ice types that are present. The result of the ice cover algorithm is an ice "mask." Sea and lake ice influences the surface radiation budget, and affects the exchange of energy and moisture between the atmosphere and the underlying water. It is one of the key factors to consider in the atmospheric circulation, numerical weather forecasting, and climate models. Ice cover is also important for planning commercial transport. Ice cover and concentration are among the most important indices to study climate change. Accurate retrievals of ice cover and concentration are of high importance both to the scientific communities and to the public.